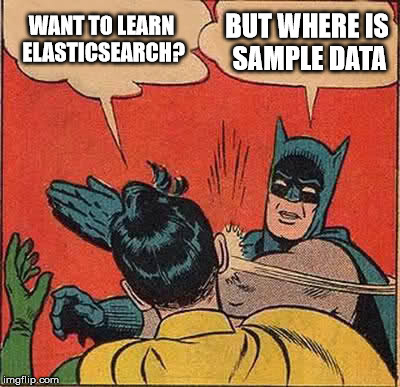 This ElasticSearch Sample Data is to be used for learning purpose only. It is randomly generated but still care has been taken to make it look like real world data. Many people who are on path to learn ElasticSearch get stumped on this. Yes. Indeed where are large ElasticSearch Sample Data they can use to hone their ElasticSearch Kung-Fu? Well you are at right place. Here is ElasticSearch Sample Data in form of two formatted json data files I created for myself for learning purposes. One has records of 50000 employees while another one has 100000 employees. 1–Download curl. I am using linux which usually has curl. 2–Download and extract the data files. 3–Run these commands to load the data. First command creates an index with right mapping. The second one loads data. Might take some time. 4–Access the url http://localhost:9200/companydatabase/_count?pretty=1 to check if the data is there or not. Though it is random generated but still I have tried to keep lot of structure in it. "Interests": "Renting movies,Scuba Diving,Snowboarding,Butterfly Watching,Dumpster Diving,Badminton,Church/church activities"
I used this website to generate the random addresses. I used this website to generate the list of hobbies. Source of Male first names is this. Source of Female first names is this. Source of Surnames is this. I will post the program I wrote to generate the random data once I clean it up and it is presentable. Meanwhile if you want smaller ElasticSearch Sample Data sets then give me a shout. I will generate and put that up. Maybe add a StartDate date field (yyyy-mm-dd); could open demo possibilities for timeline style queries like “what is the most popular hiring month?” etc. Sorry for late response. It is not that I did not read the comment but just that I was too busy to work on that. However that being said I have updated the sample data and you can use it if you still need it. My machine was Linux. Are you on windows? If so then the single quotes around the command should be replaced by double quotes.